The Fratello Navetta line of premium cigars started out as Omar de Frias' dream project during his years with NASA and became a reality in 2017, four years after the initial launch of Fratello Cigars. Navetta means shuttle in Italian and each of the vitolas in the line is named in honor of a NASA space shuttle. Omar's goal was to translate the ultimate celebration of a successful mission at the space program into a very special cigar to commemorate such momentous occasions. 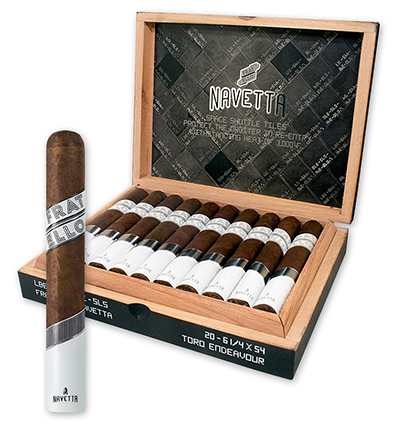 Handmade in Nicaragua at Joya de Nicaragua, the Fratello Navetta's dark Ecuadorian Oscuro wrapper covers a Dominican Viso binder and Jalapa filler tobaccos from Nicaragua delivering a dense and complex medium- to full-bodied smoke with notes of dark chocolate, roasted coffee, nuts, caramel and spice. Light up a Navetta and we assure you the occasion will become special.